Shows the inert body of Christ surrounded by the Virgin, St. Peter and Mary Magdalene, St. John the Evangelist, St. Jerome and St. Paul. The altarpiece was originally commissioned for the Pauline monastery in Florence. Botticelli’s extraordinary mastery of drawing and elastic contour became progressively simplified and economized, occasionally producing even a crudeness of effect; his colours, notably his greens, yellows and reds, became brighter and purer in hue; and the action of his profoundly felt dramas was staged in an abstract and otherworldly environment that is the imaginative counterpart to the simple backdrops designed for a mystery play. 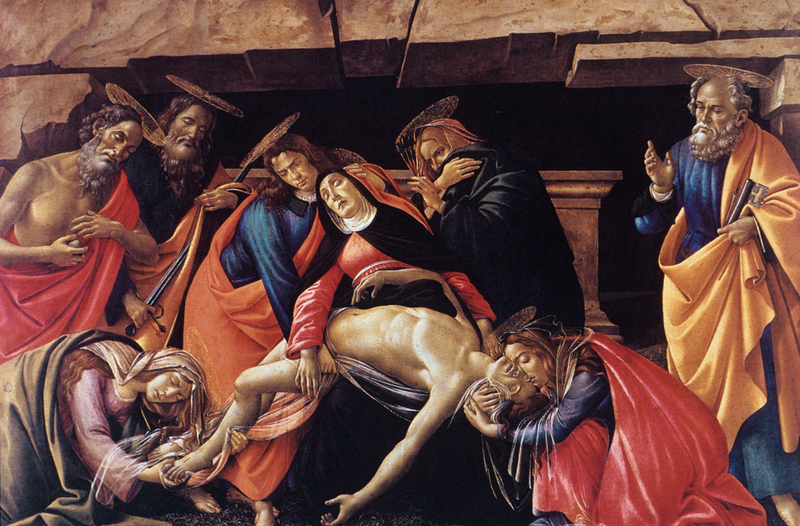 Sandro Botticelli (Italian painter, ca. 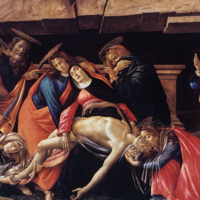 1444-1510), “Lamentation over the Dead Christ,” Institute Images Online, accessed April 24, 2019, http://westerncivart.com/items/show/2770.